Freightliner Trucks is connecting with economic development officials, vocational truck owners and the men and women who operate them with a new program launched earlier this year. The Freightliner Trucks Hardest Working Cities recognition program acknowledging the vital role work trucks play in stimulating economies across the United States and Canada. As part of the program, Freightliner is honoring Indianapolis, Salt Lake City, Nashville, Los Angeles, Toronto and Dallas during 2015. As part of the recognition, Freightliner hosts an award celebration in each city for customers, local government and economic development officials, truck equipment manufacturers and dealers. Additionally, surprise jobsite visits are coordinated to thank workers who have contributed to the achievement. 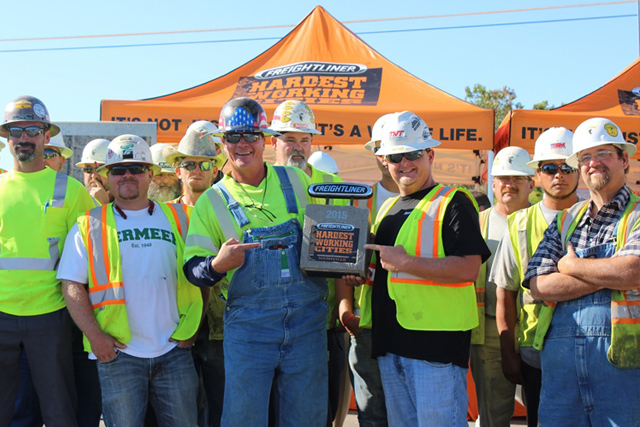 Hundreds of workers have been treated to coffee, donuts and free gift items such as safety vests, t-shirts, hats and coffee mugs, all stamped with the Freightliner Trucks Hardest Working Cities logo. The selection process uses a set of 11 different criteria that measure everything from improvement to employment rates to housing starts and per capita hours worked to vocational truck sales. Freightliner plans to announce new cities as part of the program during 2016. For more information about Freightliner Trucks Hardest Working Cities and to find out more details about upcoming city celebrations, visit HardestWorkingCities.com.